Historically, CDI specialists transition to CDI from case management or HIM/coding due to the lack of experienced CDI specialists in the world. Today, those who do hold multiple years’ worth of CDI experience often earn top-dollar when changing careers and/or have moved up to management or director positions. Those coming into the role now, are often home-grown, mentored, and educated by existing staff. As a result, CDI departments need to develop (or at least begin thinking about establishing) a career ladder for their programs. Career ladders help provide mobility to those who’ve served multiple years in the role and who’ve now been tasked with additional responsibilities such as mentoring new hires, educating physicians, and expanding review focus areas. The objective of a career ladder is to motivate existing staff, specifically the younger generation, to stay in the field of CDI. Many individuals will seek other opportunities when they no longer feel that there are career advancement opportunities or compensation growth. Currently, most CDI departments consist of either a CDI director or CDI manager and CDI specialists. These CDI specialist positions typically do not indicate levels of experience, which may pose some salary negotiation issues for the hiring CDI manager and the human resources department. Typically, an entry level CDI specialist has 0–2 years of experience; a midlevel CDI specialist has 2–4 years of CDI experience, and may have obtained appropriate credentials. There is frequently a misconception that a CDI specialist position is a lateral move from a compensation perspective for a nurse coming from the clinical world, but in truth it really is not a lateral move, because a new skill set will be acquired on the job as a CDI specialist. Additionally, a CDI specialist role includes other perks, like not needing to work weekends, nights, or holidays, which may not be always true in the clinical setting. Therefore, as the CDI industry continues to expand, we may see additional benchmarks and guidance on how to appropriately pay CDI professionals based on their level of experience and expertise. Those interested in learning more about current trends in CDI compensation and salary should look to the annual salary survey reports published by ACDIS. The career ladder structure and associated compensation increments will hopefully establish a common industry standard in terms of staffing and department structure. 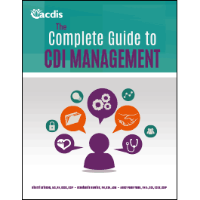 Editor’s note: This article is an excerpt from the Complete Guide to CDI Management.